If you are a Momoa or DC comics fan you will be pleased to know that this Aquaman is a quality version and won’t disappoint even the most skeptical amongst us. In 1941 Aquaman was introduced in a backup feature of the DC comics. Over the years he was more of a minor character in the DC Universe even though he is part of the Justice League. In the past, he was drawn as a blonde haired, fair skinned pretty boy who rode a seahorse. He was taken very seriously over the years even in the Saturday morning cartoons. All that changed in 2014 when it was announced that Aquaman would be part of the Justice League film and would be played by Jason Momoa (Game of Thrones). By December it was announced there would also be a solo Aquaman movie which came to theaters four years later. Now the successful superhero film is heading to home theaters. Lighthouse keeper Thomas Curry (Temuera Morrison; Once Were Warriors) lived alone until one night he rescued Atlanna (Nicole Kidman; The Hours) during a violent storm. They fell in love and had a son named Arthur (Momoa). They were happy until one day warriors from the sea came for their Queen. Forced to abandon her love and her son, Atlanna vowed to return but never did. Arthur however, seemed to live in two worlds – he was human but he could communicate with underwater sea life and could ride the ocean as no human could. Arthur was content living on land until princess Mera (Amber Heard; The Rum Diary) finds him and tells him his half-brother, King Orm (Patrick Wilson; Insidious) is going to wage war on the surface world. Arthur is reluctant to enter a world he does not know and fight an enemy he has never met. Complicating matters is a villain working with Orm named Black Manta (Yahya Abdul-Mateen II; The Get Down) who has a personal vendetta against Arthur. At first defeated, Arthur fights back and not only finds a kingdom but his long lost mother as well. Momoa was brilliant casting as his Polynesian roots make him an excellent choice to portray a warrior who worships and controls the sea. He brings Aquaman to life as no other actor could with physical strength and a tough exterior protecting a soft and sentimental inner being. Kidman is also well cast as is Heard. They portray strong women who have a sense of purpose and pride. Wilson brings a meanness to his role as king that makes it difficult to even remotely like him but that is the point isn't it. If any film could benefit from a 4k video presentation it is certainly Aquaman. 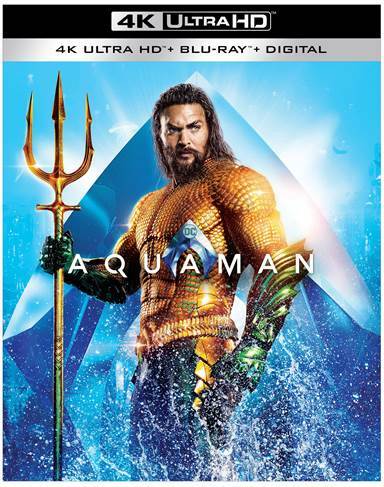 With its 2160p high definition quality and 2.40:1 aspect ratio it offers vibrant colors and brilliant details including those of Aquaman's armor. The Dolby Atmos audio is a worthy complement to the video and highlights the soundtrack and special effect well. The Combo pack offers a number of interesting extras with behind the scenes footage and discussion on everything from casting, costumes and stunts. They include: Going Deep Into the World of Aquaman, Becoming Aquaman, James Wan: World Builder, Aqua-Tech, Atlantis Warfare, The Dark Depths of Black Manta, Heroines of Atlantis, Villainous Training, Kingdoms of the Seven Seas, Creating Undersea Creatures, A Match Made in Atlantis, Scene Study Breakdowns and Exclusive Sneak Peek of Shazam! Director James Wan (Furious 7) does a nice job with the action sequences and keeps the flow of the film moving at a decent pace. My only complaint about the movie is that the underwater scenes look a little fake and cheesy. Otherwise, Aquaman has a good cast, excellent costumes, and an interesting story. If you are a Momoa or DC Comics fan you will be pleased to know that this Aquaman is a quality version and won't disappoint even the most skeptical amongst us. Download Aquaman from the iTunes Store in Digial HD. For more information about Aquaman visit the FlickDirect Movie Database.